I have to make MO diagrams but I'am not really sure if they are fully correct. 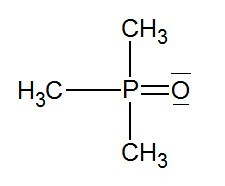 Let's start with the dubble bond of trimethyl phosphinoxide. 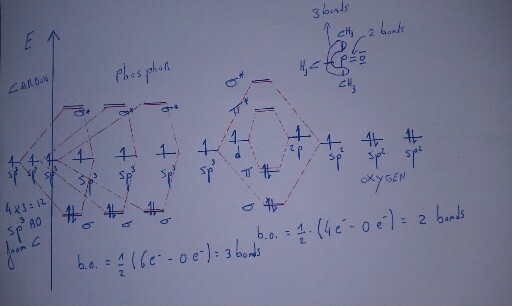 I suppose that phosphor does have sp3d orbitals and oxygen have sp2 orbitals. Ok, here is my first attempt but I made a mistake because the bindingsorder (b.o.) 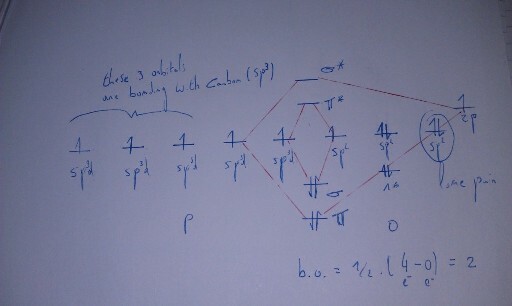 tells you the number of bonds that are formed, in this case it have to be 2, but there is something wrong with the diagram. Communication isn't perfect because I have to draw, take a photo, then resize it and that why it's difficult to get a topic on this interesting subject. Second attempt: I think it looks better but my question is do all sp3d orbitals have the same energy or must I draw the d-orbital apart (like above) and the p-orbital apart in sp2 ? They are then higher in energy and will form the pi-bond... What do you think ? four MO´s for the double bond. Two of them with two electrons, that means four in summary and two with no electrons. Divided by two you end up with 2 for the bindungsorder...? I think it looks better but my question is do all sp3d orbitals have the same energy or must I draw the d-orbital apart (like above) and the p-orbital apart in sp2 ? That is the interesting idea of using these MO diagrams, I descriped only the formation of the P=O bond to get the concept. But I know that a b.o. of 1/2 also exist in some compounds but then it's just half the strenght of a single bond. Since the pi - bond is weaker then the sigma bond, I think that the d - orbital is somewhat higher in energy (from P) and the p - orbital of oxygen is also higher in energy. If these atomic orbitals combine then I assume that a new MO is formed which is the pi - bonding orbital and their pi antibonding MO. The only thing that I do have to dubble check are the energy levels of the pi - bonding orbitals and sigma bonding orbitals. For example in oxygen these are switched if you compare it with the molecular orbital diagram of nitrogen. 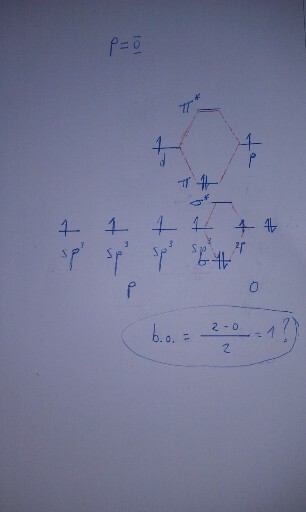 I believe it have to deal with the atomic number Z, then this molecular orbital diagram is solved.